Our interaction with people and things has changed over the years due to the internet, smart phones etc. But that’s not all; in the near future a huge change will be made in the way we interact with surroundings. You will be able to look at a building or place and get the information on the subject using just your eyes. Goggles by Google have an early concept of this idea which is an app that allows you to take a picture of an object and immediately receive information about it on your android phone. The 21st century has seen remarkable innovation in robotics. Though we are yet to make them help around the house or do our construction, there have been big strides that point towards a better future. The University of California, San Diego, used the self guided learning process to make a hyper-realistic Einstein robot smile and make facial expressions. We already have hybrid vehicles on the road but the electric cars sound promising too. According to a prediction by Kurzweil in 2008, computers will have the same intellectual capacity as humans. “People are looking to nanotechnology to carry on Moore’s Law, which allows chips to be smaller, faster and consume less energy,” says Jim Tully, the vice president and chief of research at Gartner. 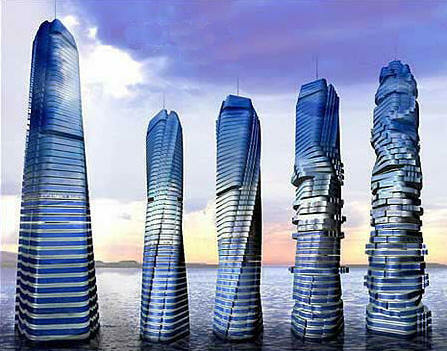 Dubai is building a tower with fancy and extremely practical applications. The building will have 59 independently rotating floors so that the inhabitants can get a constantly shifting view of the world outside. The floors will rotate at approximately 6 meters per minute each and the inhabitants will not notice the movement. The building will also get an ever changing exterior that can warp into complex designs from all the rotating. The wind turbines built in between every floor will produce pollution free energy that can power the tower and also several buildings surrounding the area. Did you know that AT&T ads made predictions to some of astounding technologies some 20 years ago? Many of these technologies are now commonplace. Check out some of their ads!